Trooper Luke Bonin noticed the flag on the left shoulder of Interstate 95, so he turned around and ran across three lanes of traffic to rescue it. 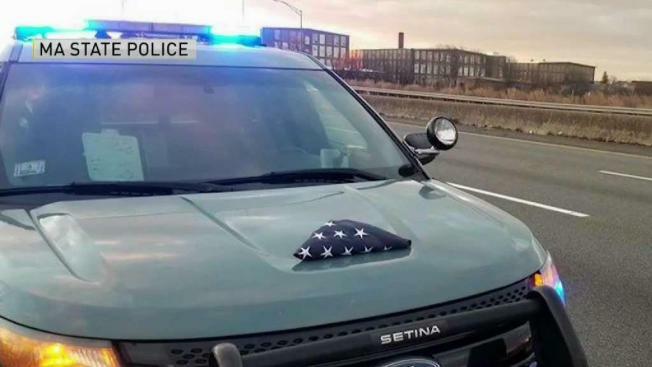 He folded the flag, placed it on the hood of his car and snapped a photo. While driving down Interstate 95 in Fall River, a Massachusetts State Police trooper noticed something on the left shoulder. It was an American flag lying on a pile of debris against a Jersey barrier. Trooper Luke Bonin turned around and ran across three lanes of traffic to rescue the flag. He folded the flag, placed it on the hood of his car and snapped a photo. In a Facebook post, Bonin wrote, "To paraphrase the late Johnny Cash, 'it was a ragged old flag, but I made sure to fold her up right.'"